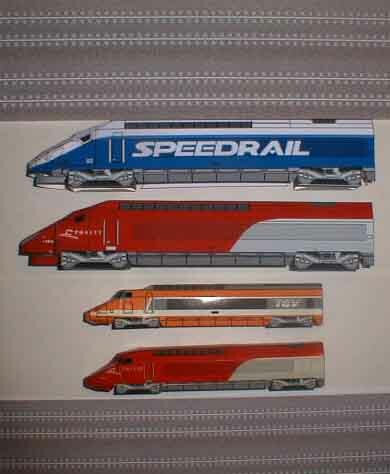 Most of these models shown here were built by readers of TGVweb. Send pictures of your finished models and they will be displayed here! 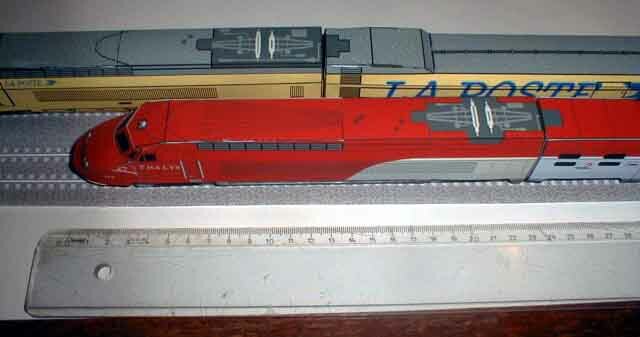 TGV Duplex by Clem Tillier. 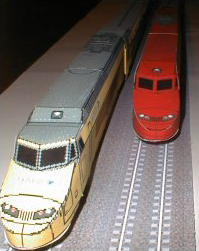 A pencil is shown in one picture to indicate the approximate size of the model. 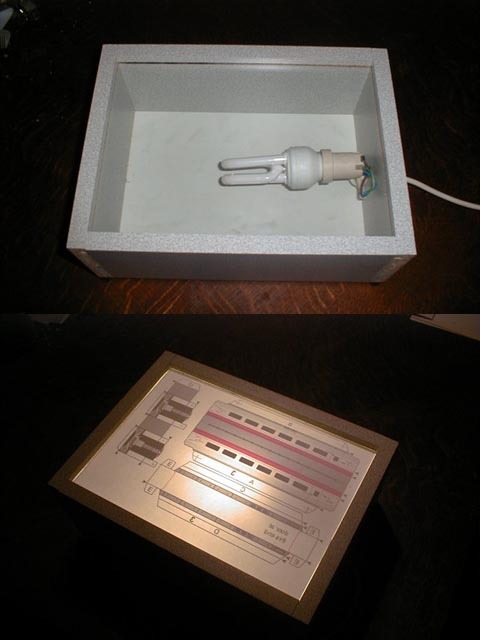 Light Box by Raymond Van Campenhout. He uses this box to score the back side of his parts sheets, using the light to see through the paper. This avoids damaging the printed side of the paper, and it's much easier than using pin holes to mark both ends of a fold. 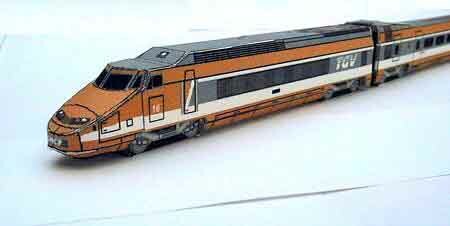 TGV Sud-Est by Pierre Gauriat, who also wrote a review of the model. 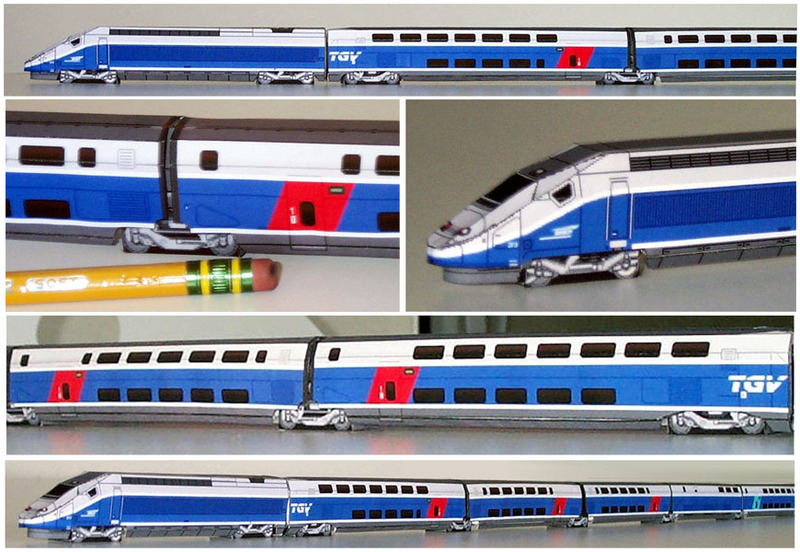 TGV La Poste and TGV Thalys PBA by Raymond Van Campenhout, both at 150% larger than the parts sheets or close to HO scale. 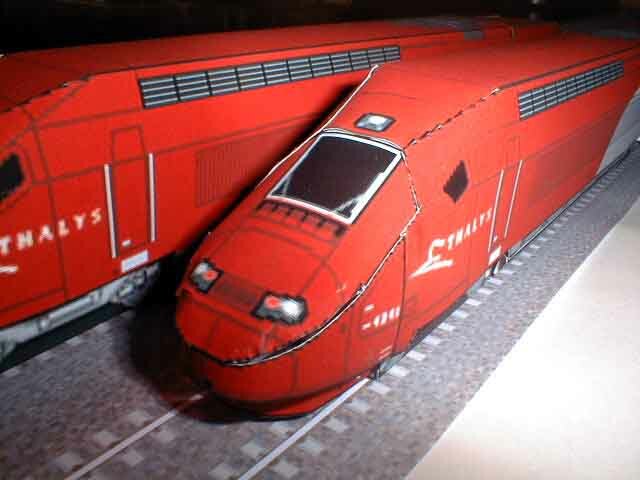 TGV Thalys PBKA by Raymond Van Campenhout. Raymond further improved the model on the right by leaving some surfaces curved. 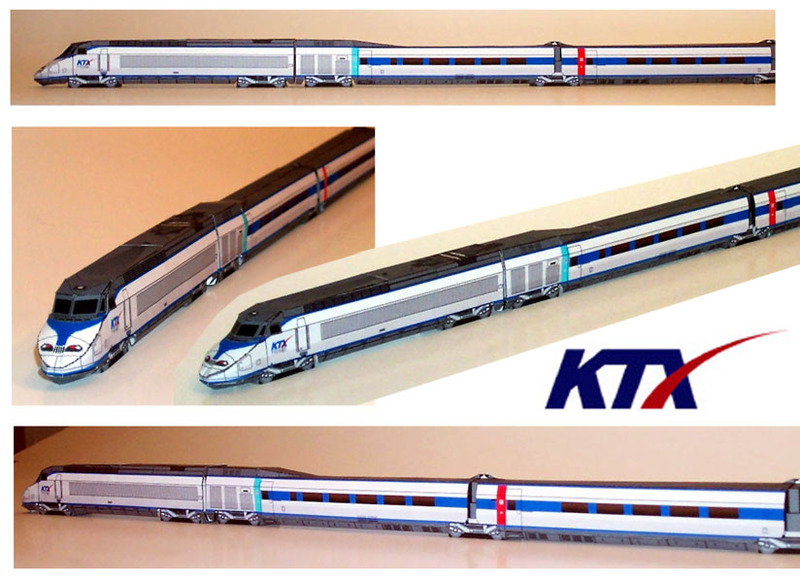 Both are built 150% larger than the parts sheets or close to HO scale. 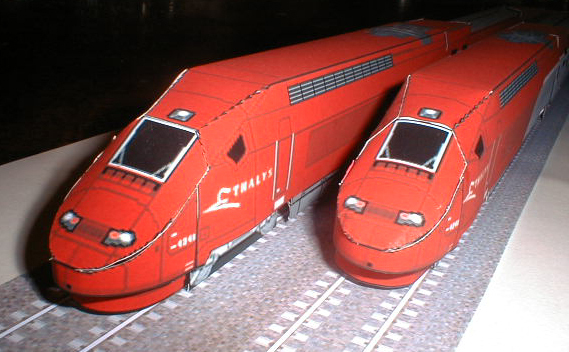 TGV Speedrail and TGV Thalys PBKA by Raymond Van Campenhout. 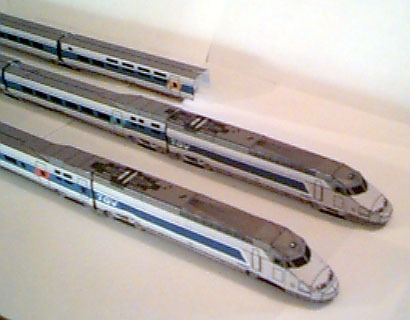 Both are built 150% larger than the parts sheets or close to HO scale. TGV Thalys PBKA by Raymond Van Campenhout. Raymond further improved the model by leaving some surfaces curved. TGVs by Raymond Van Campenhout. 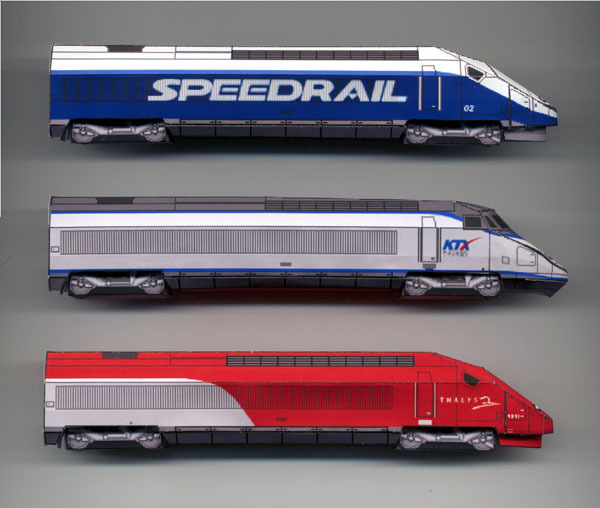 The bottom two are printed at the scale recommended on the parts sheets, while the top two (Speedrail and Thalys) are printed 150% larger or very close to HO scale. TGV La Poste and TGV Thalys PBA by Raymond Van Campenhout. 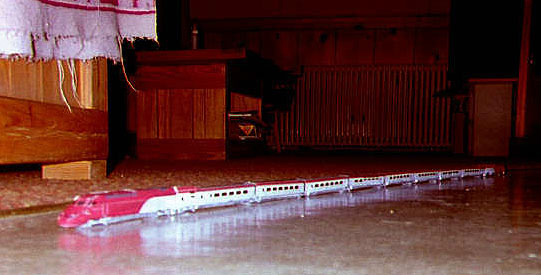 Both were built 150% larger, close to HO scale. 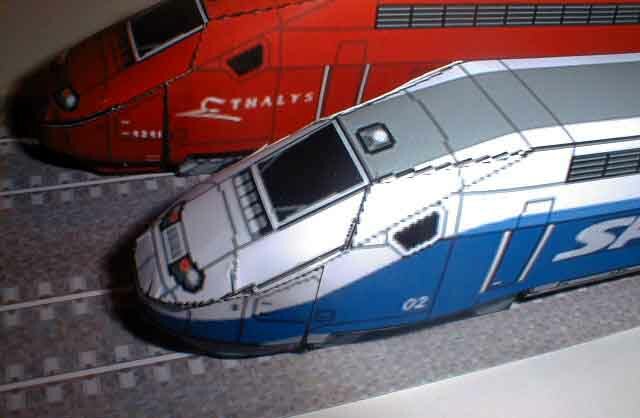 TGV La Poste and TGV Thalys PBA by Raymond Van Campenhout. TGV Thalys PBA by Raymond Van Campenhout. TGV Thalys PBA and TGV La Poste by Raymond Van Campenhout. 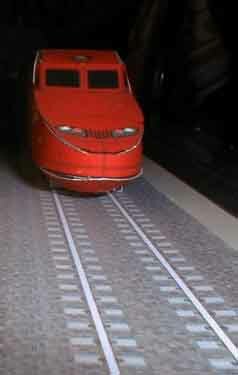 As the ruler shows, both were built about 150% larger than recommended in the part sheets, about HO scale.